Walter Methven is an indolent young man of twenty-four. To the despair of his widowed mother, he prefers a circle of friends led by the shifty Captain Underwood to the regular pleasant society of their town. It is known that Walter is a distant relation of the Scottish Lord Erradeen; but it comes as a shock to him and his mother to learn that due to several deaths in the family, he has succeeded to the title. He vows to put aside his aimless past and do some real good in his new position. Walter travels to Edinburgh to meet his solicitor, and learns that one of the conditions of bearing the title is to spend several days each year on Loch Houran in the West Highlands, at the ancient castle of Kinloch Houran. Centuries ago there was a Warlock Lord of Erradeen, an evil man who seemed to have the powers of the Devil; and some believe that he still exerts his power over each Lord Erradeen in turn. As this sinister figure begins to haunt and influence Walter after his arrival at Kinloch Houran, he reaches out to two ladies on a nearby island, Mrs Forrester and her daughter Oona. Once Walter leaves the Highlands he all too easily falls into bad company again, yet at times struggles to rise higher. Before this supernatural tale ends he will again return to Kinloch Houran; and there will be a final moral struggle between good and evil, leading to a dramatic ending. 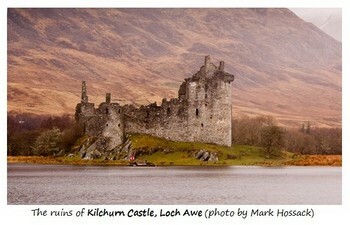 Some local references make it almost certain that the fictional castle of Kinloch Houran, on the fictional loch of Loch Houran, was inspired by Kilchurn Castle on Loch Awe. The opening scenes in The Wizard's Son are based on Margaret Oliphant's relationship with her son Cyril, who would have been twenty-five or twenty-six at the time she began writing this novel. Despite his fine intellect and Oxford education, he remained at home year after year doing little. In all fairness he was often in poor health; but the greater problem was his affinity for drink. In her Autobiography Mrs Oliphant supplies few details, yet makes it clear how deeply she suffered from his behaviour, and from her helplessness to bring about change. In an earlier story, The Secret Chamber, Mrs Oliphant first developed the theme of a ghost of an ancient ancestor maintaining a sinister hold over each generation of descendants. See the Related Story Line entry below.